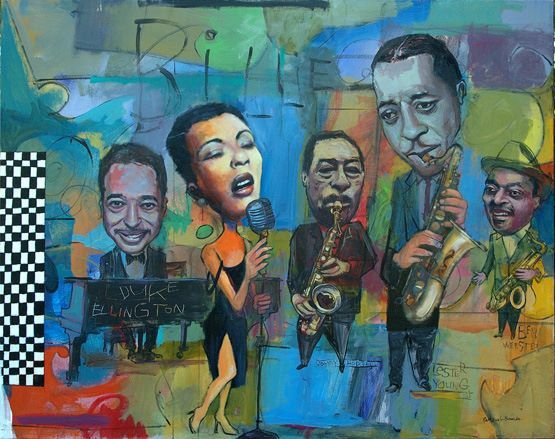 Jazz Appreciation Month was created to be an annual event that would pay tribute to jazz as both a living and as a historic music. Schools, organizations, even governments, celebrate JAM with events ranging from free concerts to educational programs. The first year was 2001, and initial funding was provided by the Ella Fitzgerald Charitable Foundation. (Miss Fitzgerald’s archives are housed at the Smithsonian). Situated on “The Block” in the heart of Central Avenue, the Club Alabam served as a primary site for the “West Coast Renaissance of Jazz” in Los Angeles. Previously called the Apex Club, the club opened in the Fall of 1928 and was owned by the drummer Curtis Mosby. “Mosby’s Bluesblowers” provided the house big band that performed for top entertainers like Duke Ellington. Mosby’s brother Evan, another Central Avenue fixture, became known as the “unofficial mayor” of Central Avenue . While the Club Alabam faced Central Ave. , competition from other “blues incubators” like the Last Word, the Down Beat, Shepp’s Playhouse, Watt’s Joe Morris’s Plantation and Johnny Otis’s Barrel House. Locals considered the Club Alabam the classiest establishment on Central Avenue, complete with valet parking and a in-house chorus line . the Club Alabam served mainly the black upper-middle class, but it became a popular spot among the black working class as well. Alex Lovejoy owned the “Breakfast Club,” the club’s second floor room, which served fried chicken, hot biscuits, and drinks. On any given night at the famed Club Alabam, only the best of the best performed and sat-in with the house bands over the years ,such as Mile Davis, Lester Young, Duke Ellington, Billy Holiday, Dorothy Dandridge.. Like the Harlem integrated club, Cotton club, It too attracted white high-profile Hollywood entertainers. Even the likes of a very inebriated W.C. Fields who enjoyed frequent visits accidentally fell asleep inside the adjacent Dunbar Hotel and became the first to integrate the hotel unknowingly. This hot Jazz musical Revue will take a slice of life at the Club Alabam during the 1940s and 50s ,by presenting a bevy of allstar musicians, singers and actors who portray the likes of Cab Calloway, Billie Holiday, Dorothy Dandridge, Ella Fitzgerald and Josephine Baker.